Spring has sprung and we have launched our new topic "Terrible Tudors"
The children will enjoy learning about the wives of Henry VIII and what life was like for the Tudors. Our school trip this term will be to the New Theatre in Cardiff to watch Terrible Tudors live on stage! A fun and educational experience for the children. If you're looking for a fun, educational way to spend a day with the children, why not visit St. Fagan's where children can visit the Tudor Merchant's House. To help your children be stage ready on opening night we have provided a copy below of the songs. All the songs are to the same tune as those in the Greatest Showman! We can't wait for opening night! In December we will be holding an Elf Day to support the Alzheimer's Society in beating Dementia! You can show your support by wearing your favourite Christmas Costume. You can come as an elf or come as yourself in your favourite Christmas jumper. The day will be full of fun festive activities to raise the Christmas spirit for an amazing cause! This Term our school topic is "Journeys" and we have cruised our way over to the USA for the ultimate road trip! P.E. Lessons are on a Monday and a Wednesday and children are required to change into suitable kit in order to participate. Children each have a Purple Mash log in and can access the resources both in school and at home. Shwmae a croeso i Ddosbarth Earth! Miss Davies yw'r athro yn Class Earth. Rydyn ni'n hoffi Miss Davies achos mae Miss Davies yn caru Nadolig. Yn y Nadolig Mae Miss Davies yn gwisgo coeden Nadolig, dyn eira, pwdin Nadolig, Cracker Nadolig a Nadolig yn bresennol. Mae hi'n ddoniol iawn. Yn ysgol Hendre rydym yn mwynhau dysgu Cymraeg, Saesneg a Mathemateg. Rydym yn caru chwarae pel-droed gyda ffrindiau a gwneud celf gyda Miss Edmunds. Yn ein Dosbarth rydyn yn caru darllen yn y teepee achos mae teepee yn anhygoel! Hello and welcome to Class Earth! We are a Year 4 class taught by Miss Davies! We love being with Miss Davies because she loves Christmas and at Christmas time she dresses up in Christmas Costumes. 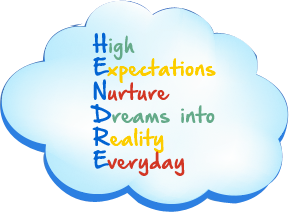 In our class we think it is important to be Ambitious, Confident, Enterprising, Healthy, Capable, Creative, Ethical and Informed just like our Hendre Heroes! We use these characters to help us complete our work with resillience, aspiration and enthusiasm!